You may not think that my work would allow me to travel but it’s not the case. Not so long ago, my wife and I took a holiday – or should I say ‘vacation’ – to the States. It can be a dangerous thing for a man to ask his wife what she would like for her fiftieth birthday, and for me it was no exception. My enquiry, when made to my wife Christine, was met with an unusual request. It wasn’t to be a big party or an expensive piece of jewellery; instead her wish was to swim with dolphins! Well who am I to argue? I had another brainwave…I was on a roll! I made some enquiries and realised that I would be able to work while we were out there. This way we could prolong the trip and also earn money to pay for it. My agent had arranged some readings for me to do, so the whole thing evolved into a half-work / half-holiday trip which would enable us to fit in some sightseeing at the same time and a visit to San Francisco for a week before we had to return home. I wasn’t totally taken by surprise by Christine’s desire to swim with dolphins as she is a big lover of animals but I was feeling quite daunted by the prospect of arranging such an activity. However, we must never shy away from challenging ourselves every day. Have faith in yourself and you can accomplish anything! I eventually settled on Florida where I finally chose and booked in a place called, “The Theatre of the Sea,” situated on Key Largo. This is indeed where Christine’s dream did come true. We had a fantastic time in Florida and after swimming with the dolphins we left the sun of the East Coast and got on our merry way to the sun of the West Coast…or so we thought! This was the end of January and when we arrived in California we found much to our surprise that it actually felt colder than the UK. Never ones to be put off, we managed to warm ourselves up at Fisherman’s Wharf by eating delicious Clam Chowder soup right out of hollowed-out loaves of bread. What does any of this have to do with Spirituality? Patience, my dear reader! 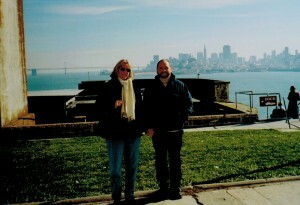 Perhaps one of the most popular tourist venues in the United States is Alcatraz prison; it certainly was one of ours. 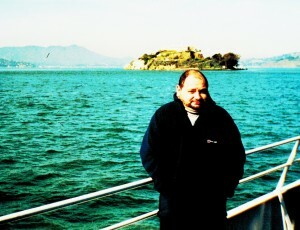 In actual fact, I had already visited San Francisco but had decided not to go to Alcatraz as I really wanted to return to the island at some point with my wife and share the experience with her. Also, I suspected that it would be brimming with energy – good and bad – and I knew I would need an ally with me for support. On a cold, grey, foggy morning, we sat at the harbour waiting for the start of the trip which we had booked across to Alcatraz Island. We huddled together for some warmth as we sat on the deck of the Bay Ferry waiting for departure. Slowly, the engines started up and the ferry, as if it were being sailed by Charon and the waters were the Styx, began to chug slowly across the San Francisco Bay to Alcatraz, The Rock. It loomed through the fog as if it were floating on clouds. Every now and again it disappeared as if into the ether and for the slightest second you’d be forgiven for thinking it was a myth the San Francisco authorities were trying to perpetuate and it was all done with mirrors. Then, it would appear again with solid certainty. Even though we were excited, the cold never left me and I shuddered with anticipation. The journey was only about fifteen minutes but as we gazed at the island which became ever closer, I began to feel a strange, dark energy emanating from the grey concrete mass which was the cell blocks. Such was the strength of this force that there was even a subdued atmosphere among the travellers. Slowly, the “Bay Princess” docked at the quay side while we hundred or so people started to disembark and step foot on the Island. Immediately, it hit me like the rock it was built on. The energy was so overpowering, I had to take a second to recollect my wits. We were shown into a huge sparse hall where folding chairs were set out in rows in front of a large cinema screen. We were given an introductory talk and then watched a short film of the Rock’s history, and the whole time I could not shake off the sense of doom I could feel. 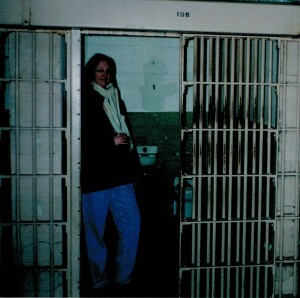 En masse, we were shown our way up to the actual cell blocks. We walked through into what had been used as the central hall where four blocks of iron cages filled the vast, dank area. Again, I was met with an overwhelming sense of futility. The doors swung open with the wind of the outside as we entered. It was as if thousands of voices were bemoaning their fate; their sudden realisation that by walking through the very doors I just had, they would in effect be saying goodbye to civilised society for years and years. As the doors closed they took the fresh wind of the outside and barred it from the inner chamber. There was an added insult to injury. There were large windows high up in the walls and you could make out what lay beyond. It made it worse to be able to look out across the bay and see the skyline of San Francisco nearby. It seemed near enough to touch. The agony of decades of inmates was palpable. This time, it was the concrete high rises which appeared in and out of the cloud-like fog and in turn, giving it a mythical status, as if they had imagined they had ever walked its hilly streets. I was so glad I had Christine with me. I began to feel physically weakened by the attack on my senses. In reality the prisoners of Alcatraz would have been locked into the iron fist of a harsh regime with little chance of an early release and absolutely no chance of escape. All around me I was assailed by the sense of hopelessness and despair that I was picking up from the residue of the massed negativity of the inmate population. The air was patently frozen as we wandered up and down blocks A, B, C and D. I looked around the other tourists to see if anyone else was feeling the cold but nobody seemed as bothered as me. Names of infamous gangsters and murderers like Al Capone and Richard Stroud (otherwise known as “The Bird Man of Alcatraz”) adorned the cells and it was impossible not to be impressed by it. But at the same time, the atmosphere almost seemed to be electric with tension and deeply chilling. The cells were little more than iron cages stacked in rows on top of each other. The prisoners must have felt crammed together like battery hens and would probably have undergone all their personal experiences as a group; there was no room for privacy. All moments of misery and depression would have been unavoidably shared. The energy left by transmitted thought was unmistakable. Perhaps the place that I felt the most negativity was the dining hall: here, I experienced my most vivid intuitions. I don’t know why – maybe this would have been the one time of the day which was most like something they would have been doing with their friends and family; a tortuous reminder of what they were missing. You could almost hear the mealtime activity with the looming presence of the shotgun-carrying guards. I looked down from the window into a corner of the large and grubby exercise yard where the prisoners were allowed to stroll freely only once a week. Their only taste of freedom. You could imagine them looking forward to this little piece of freedom with a nervous excitement, being able to breathe clean air for an hour or so before again being locked up for yet another long and interminable week. I’m often questioned about hauntings and I have attended many houses where people have been living in fear because of what they have felt to be as an “evil presence” has begun to reside in their own homes. There is a common misconception that a “presence” is always down to paranormal ghostly activity; something meta-physical sharing the same space and time as them. On the contrary, I have found through experience that in the main, the cause can be much simpler. Often, a negative vibration alone can bring this destructive influence into play, like an echo of moments past or a shadow of old energies. Thoughts and emotions linger for a longer time than most people can appreciate so energy (be it positive or negative) can inhabit a home or area indefinitely. I must say that in no other place have I ever experienced this phenomenon more intensely than on The Rock: the mysterious island of Alcatraz.